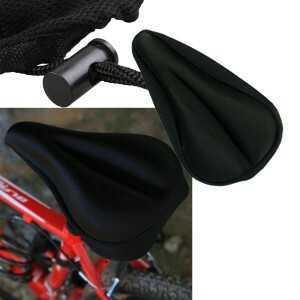 50 Gel Pad Bike Bicycle Cycle Comfort Gel Padded Cushion Seat Cover Saddle - ONLY 79P Each - BARGAIN! Gel saddle covers offer an additional layer of comfort where you need it most. Easily fitted over your existing saddle, it`s a handy accessory to offer a quick solution for that extra bit of padding while you`re riding. The gel is housed in anatomically-targeted zones relieving pressure and reducing weight, making you ride for longer without discomfort. The Bike Seat cover adds some comfort to your saddle, making this an inexpensive and easy way of improving the saddle without actually changing it. It moulds to your shape and the gel absorbs the pressure, so that you can feel comfy and fresh and not end up walking funny like a cowboy once you`re off the saddle. Must-have.